This half-octagonal cedar deck originally had a raised hot tub installed in the middle. 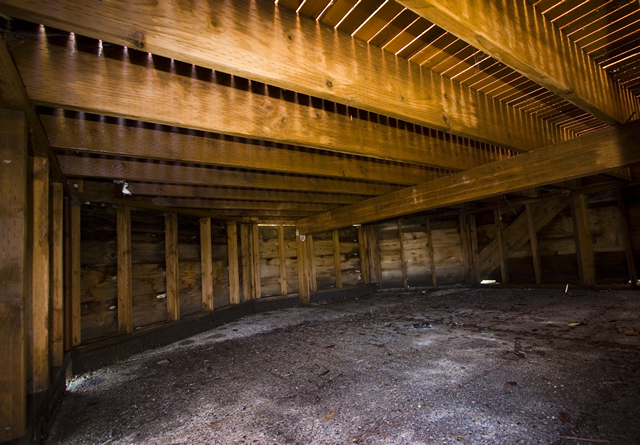 Underneath the raised structure is a concrete slab, surrounded by the framed support walls. A blockage in the drain hole on the slab, and the non-treated framing, had combined to create extensive rot throughout the entire structure. All that could be salvaged from the original construction was the glass and the lower wall siding. Here the completed new framing is all treated lumber. The confusing mess of supports for the old hot tub, which served to trap a lot of moisture, has been eliminated. Each stick of the wall framing was individually replaced one at a time, so as to leave the exterior siding and trim in place during reconstruction. The railings were completely dismantled, and almost all of the lumber was replaced during reconstruction. 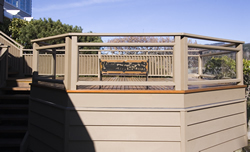 The design of the railings and posts carefully replicates the original layout so that the glass sheets (which could not be cut because they were tempered) could be reinstalled in their original locations. 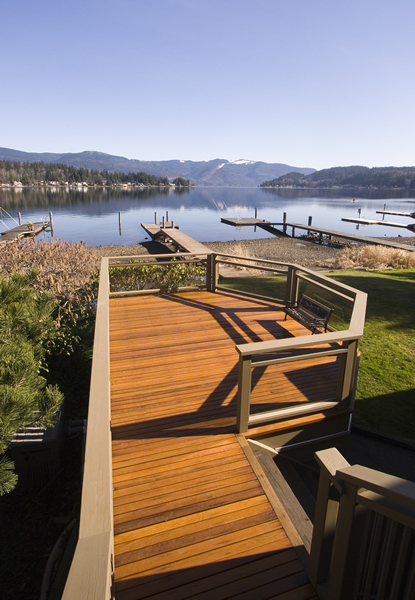 The finished deck looks out over an impressive view, but also receives an equally impressive onslaught of weather from the lake. Rain and driving wind delayed constructing for long periods of time. 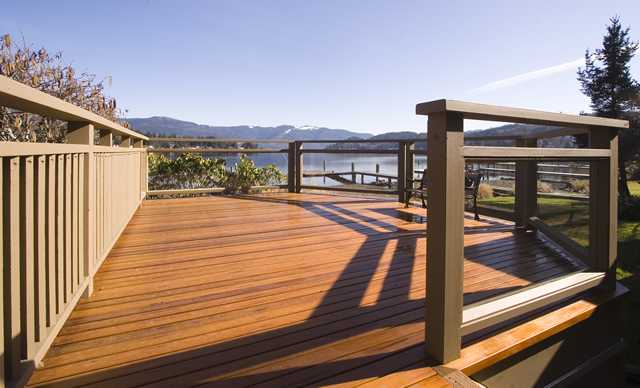 The decking is very expensive clear 2x3 cedar, which was used to match other, undisturbed, areas of deck that it ties into. 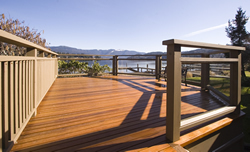 To preserve the investment in materials each board was pre-coated before installation on all sides with a high quality finish, blocking the moisture from underneath that had been the demise of the previous decking.